One of the amazing things about living in New York City is that there’s a restaurant on almost every single city block, sometimes as many as five or six. Manhattan is 24 sq. miles, with over 23,499 restaurants in that borough alone. The hottest, trendiest restaurants are always popping up all over town, and quite frankly, just as many go under. However, it’s a foodie’s paradise. Rhonda and I used to live on 84th Street, on the east side of town. One day, we discovered Trastevere, a tiny hole in the wall Italian restaurant, just a couple of blocks away. The night we went there, we both ordered the house specialty, veal piard. When it came, we were both pleasantly surprised that the bone was still attached and it literally hung over the plate. We've had veal piard… but not like this. 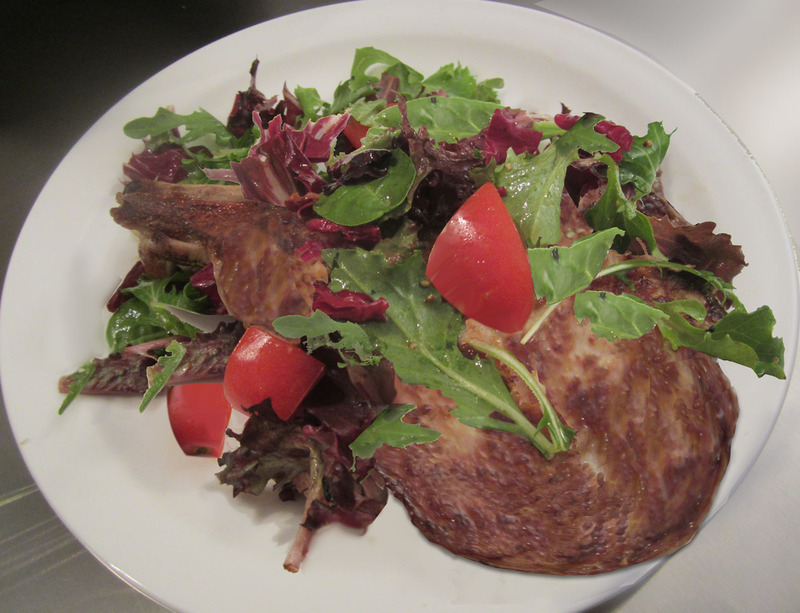 Covered with a fresh green salad on top, the mixture of the warm veal with the cold salad was outstanding. Twenty-five or so years later, I still remember it well. To prepare this dish you need to get to a butcher who carries this cut of meat. Note: Veal is expensive. 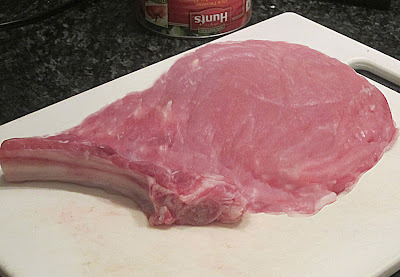 Ask the butcher for a 1” thick veal chop and ask him to fillet it like the open page of a book, leaving the bone attached. 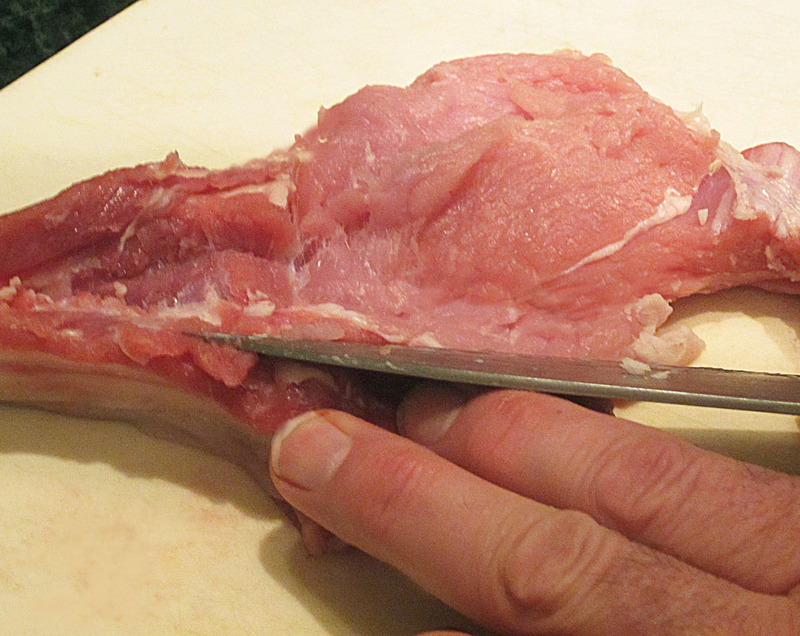 Usually, a butcher will use the side of a butcher’s knife to pound it flat. Before cooking, prepare the salad. You want to be able to add it to the top of the cooked piard so that you can get both the hot and cold flavors together. Go to Famous Salad Dressing (Rhonda) posted June 17, and follow the recipe. For those of you who are more adventurous, you can buy the veal chop and fillet it yourself. 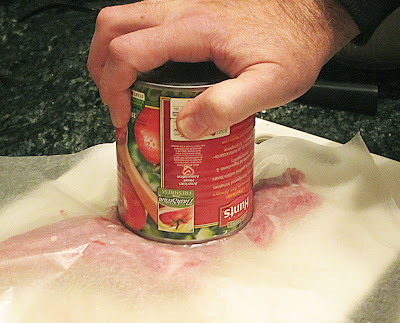 After you fillet it, you have to pound it thin by placing it between two sheets of wax paper and using a heavy can. I like to sear the veal, so I put a cast iron skillet on the flame for several minutes before placing the veal in the skillet. Cut off some extra fat from the chop and place it in the skillet to lightly grease it, then remove and place the veal piard in the skillet. Warning! Veal is a very tender cut… you don’t want to overcook it. Plate the piard and then add the salad over it. Enjoy!